It's that time again. Another Fix it Friday over at I Heart Faces. I have seen this photo on Amy's site just the other day, and I thought it was lovely. But, I have been dying to do one of those dreamy pastel edits that look so sweet. At my house these days, there aren't any more tea parties and pastel settings to be had. *sniff* I can just imagine my two big girls rolling their eyes at me now. And the boys...fuhget about it! So, this was my chance! I had so much fun playing around with this sweet image. And just for good measure, I added a little texture around the edges. This is (mostly) warm grunge, one of the freebie textures from Kim Klassen. LOVE them. Head on over to the website for more edits on the same image. On Monday and Tuesday, I<3 Faces hosts a photography challenge every week. Here is my entry for GO RED. I just happen to have a recent photo of a little boy on a red carpet. Where do you find a red carpet? At a church, of course. Most folks don't get naked in the worship center, but we went there for this one. He is actually on a prayer shawl that was made for him by some of the ladies in the church before he was born. So, for this family, it is a meaningful place to have his baby photos made. A New Forum, a giveaway, AND a discount code? That's right. 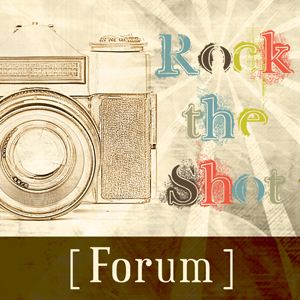 Get in on the ground floor of a brand new forum that looks very promising. They have had an interview with Keri Meyers, and several other recognizable names on board. Use the code RTSFRIEND to get 20% off any subscription. There are several options, so you can try it without breaking the bank. Join this week, and you will be entered to win a new Flip Camera. I love mine. Fits in my purse, and I don't have to run down my phone battery to catch the kids' programs at school, etc. Come on over and join in! This week, I was determined to streamline my blog stalking and emails, rss, etc. But now I have something akin to the flu. All bets are off. I can't sleep, so why not catch up? Here is my edit for today's Fix it Friday Challenge. I loooove the one they used at the top of the blog post. Come on in and check this out with me. 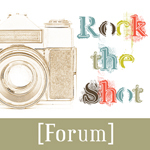 A new forum is starting up, called Rock the Shot. It has some names you will recognize, and looks promising! There is a code on facebook to get a free week trial for the first 250 fans. Check it out! They are different collections of nature and architecture photographs which have been edited and textured to give them a more artsy, personalized feel. Anyone who would like to check them out would be most welcome. I am new to this SEO, storefront, world. 1. I try to stalk more blogs than I can remember, constantly confusing myself and feeling behind. 2. I never ever go to bed when I say I will---always add at LEAST 30 minutes, if not 3 hours. 4. I am writing this entry because my computer died and lost the informative and well researched entry i was typing earlier. 5. I am fairly certain that no one will ever read these! 6. I spent over an hour today wandering around in Office Depot, because I had trouble making decisions. Even in the ink pen department. 7. I am an absolute sucker for buying stationery, even though I almost never write letters. 8. Occasionally, I will send someone a note, just as an excuse to use some cute stationery. 9. I am super excited because my 3yr old son is spending the night with his Mimi. And, I convinced my husband to run the 7 am "school bus" shuttle in the morning. In case you are not a mom, I will spell this out....I get to SLEEP LATE!!!!!!!!!!!!! 10. I am fighting a losing battle against the new single spacing after a period rule. I cannot bring myself to hit less keys.